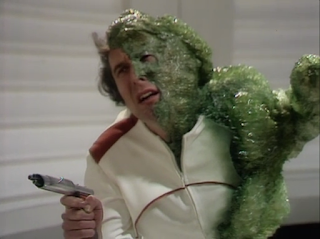 The Ark in Space is the story which really sets off the Tom Baker era. Robot could have easily featured Jon Pertwee in the role but Pertwee wouldn't suit this new story. This was because this adventure saw a new production team take the helm and stamp their own abilities on it. It is very much In the mode William Hartnell and Patrick Troughton stories had that once again saw the Doctor travelling out amongst the stars. Giving the Doctor the ability to once more travel through time and space keeps the stories dramatically compelling as he never knows where he is going and because of this there is a new sense of mystery and danger. And it stopped the main characters from becoming boring. 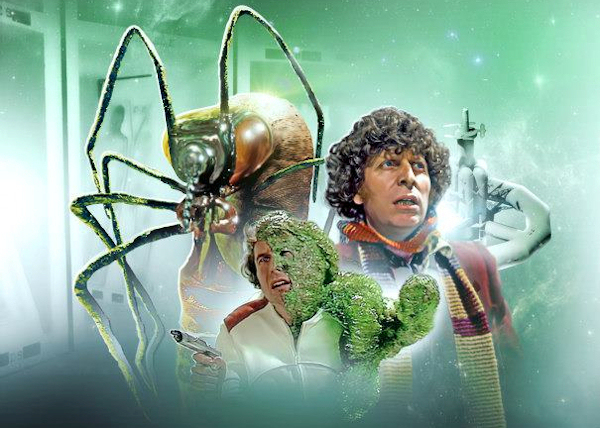 Here, the Doctor has to save a space station filled with the last surviving members of the human race. He has to protect them against an onslaught of gigantic space insects who can consume not only the human body but human memories as well. This story has a very Troughton feel about it as it is essentially a base under siege tale. What is so innovative about The Ark in Space wasn't really the story being told but the way the story was being told. 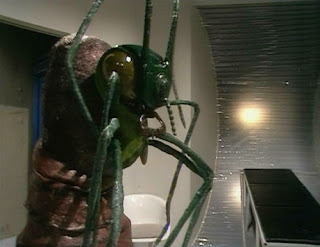 Producer, Phillip Hinchcliffe and script editor, Robert Holmes vision of the series was darker and more serious and the pair openly embraced horror elements, particularly body horror, lingering on slow transformation of the unlucky humans into a hostile insect. It goes for a level of creepiness that previous stories had always kept to a simmer. The story also ushered in a brand new wave of popularity for the show in 1975 and was one of the highest rated tales from the classic era with the audience climbing from 9 to 13.6 million just between episodes 1 and 2. It has also gone on to influence the modern series with both Russell T. Davies and Steven Moffat saying it is one of the best classic adventures and both would homage it in their respective first seasons. It is also a good jumping on point for modern viewers looking to get into the classic stuff. The only thing that might initially put some viewers off is the obviously outdated effects that haven't aged well and the introduction to the main characters is a bit strange as they all arrive in mid argument. There is no explanation as to who they are and how they got there in the first place. But if are patient or know the characters are the Fourth Doctor and his companions, Sarah Jane Smith and Harry Sullivan then you can follow the story easily enough. Newcomer, Lt. Harry Sullivan is someone whose doofusiness and chauvinism make him a less than ideal travelling companion. But he makes up for his stupidity with his endless bravery and his good heart. Beginning only moments after Robot, the Doctor had offered Sarah and Harry one journey to the moon to prove to Harry how the TARDIS works. What the Doctor doesn't count on is Harry mucking about with things. Naturally curious about the way the TARDIS works, Harry twists a dial and flings them off into the far future. But what they find is beyond the Doctor's and Sarah's comfort zones as the Doctor has no idea where and when they've landed, not to mention what they'll find. After spending years on earth, we viewers are thrown into a potentially dangerous and unknown territory. 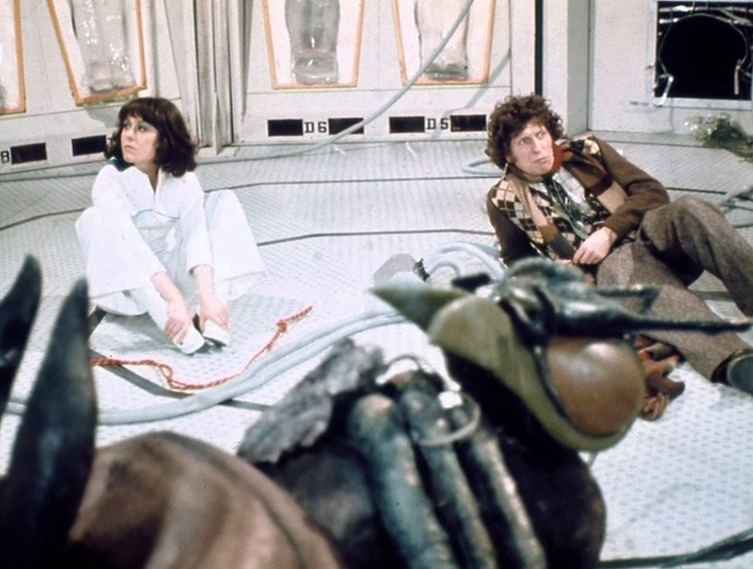 The Doctor's natural instinct is to explore and the entire first episode features only the three regulars exploring an abandoned space station whose mysteries slowly but surely begin to piece together. The pacing is almost leisurely compared to modern who. 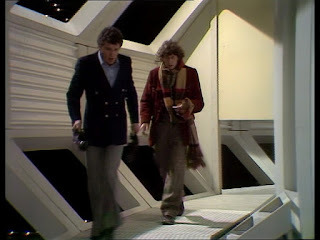 But the 25 minutes of exploration are neither dull or boring, between the Doctor's natural curiosity and Harry's compulsion to flick any switch he sees, the crew quickly find themselves in trouble. 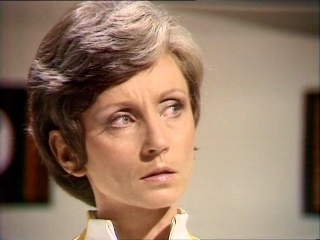 With low power and oxygen and with help from an unwitting Harry, Sarah finds herself trapped in an airless room and in rescuing her, the Doctor and Harry get trapped themselves. Restoring power so the air vent system, the Doctor also reactivates a deadly security system which threatens to kill the Doctor and Harry with electrocution. Sarah has accidently been put in a suspended animation bed, where she ends up sleeping in one of the chambers. Harry then makes an unpleasant discovery when he tries to wake her but finds what caused the sabotage falls out on him instead! The first part of this story is far from being pointless. Different events conspire so that the crew discover they have landed on a futuristic equivalent of a fallout shelter as Nerva Beacon holds thousands of human beings in cryogenic suspension. Plus an archive of biological, historical and cultural treasures that have all been collected to repopulate the Earth after a series of devastating solar flares destroyed the surface of the planet thousands of years ago. But due to the sabotage, the humans have continued to sleep. The alien Wirrn purposefully shut down the security system and wound up closing everything down. As well as keeping the humans asleep, it ironically kept the Wirrn in hibernation as its larvae remained dormant until the TARDIS crew arrived. It is an interesting twist that the Doctor's presence not only offers the human race some hop of survival but also reawakens the very creature who threaten that survival. Logically, the first human to wake up is the stations medical officer, Vira, who is almost mummified. The cryo-chamber bear an unsettling resemblance to a morgue. And the similarity obviously wasn't lost on author, Robert Holmes as he had originally intended all the characters to come out as zombies. While Vira is unemotional to the point of coldness, she isn't overtly hostile. She is just so intent on doing her job that she looses touch with her own feelings. Before waking Sarah she asks if she is of value. This coldness is probably essential as the Ark can only hold thousands, rather than the millions of people of Earth. One imagines there must have been a ruthless screening process to decide who could go to the Ark and who couldn't. Luckily, the rest of the revived crew are more relatable, like the grumpy technician Rogin. But the first impressions from all of the characters help to drive home the fact to Sarah and Harry just how far from home they actually are. And after having helped Sarah, Vira then turns her attention to their leader, Lazor, who goes by the name of Noah. She explains that the name is from mythology which again helps show the audience just how much the world will have changed. As the idea of someone called Noah being in charge of an Ark needs to be explained it implies that Christianity has all but been forgotten by the 30th century. If you think that Vira isn't very nice, then Noah is even worse. He is suspicious, unfriendly and constantly worried about the effect the three 'regressives' might have on his carefully tended garden of frozen humans. But it is important to try and see everything from his point of view since it is tragic transformation into one of the Wirrn that is the tragic heart of this story. So whatever faults he may have and believe me, his belief in genetic purity is hard to forgive, Noah is firmly in the position of a great hero as he is in charge of saving all of human culture from destruction. This makes it all the more devastating to his people when he is taken over by the Wirrn as he is not only turned into something where he loses all of his humanity, he is turned into an engine of destruction for everything he had once pledged to protect. Throughout this story he continuously wrestles with himself as he is fighting a doomed battle between his human and inhuman selves. And then we are given the bombshell that the Wirrn are only attacking the humans because the humans had once attacked them. This doesn't forgive their attempt at genocide but it does mean hat they are not unsympathetic or uncomplicated. It is of course possible that the Wirrn have a perfectly valid grievance against humanity if they are telling the truth about humans genocidally attacking them first. But unlike the previous five years, this Doctor doesn't want to reconcile the two sides. The Doctor calls the Wirrn's plan to make themselves galactic rulers, "The most immoral idea I've heard for centuries." And then he sets about trying to destroy them. That is probably the biggest flaw in the story. While it dances with the idea that the issues here might not be as black and white as they first appear, the story just sort of goes "Nah" and wastes no time in cracking out a six foot tall can of bug spray.